Founded in 1987 by Robert E. Boyer, Boyer Construction is a leading construction company specializing in high-end residential projects, remodels, restoration, commercial construction, public works ventures and enterprises projects in Northern California. The company was built upon the core philosophy to lead with an uncompromising commitment to quality, integrity and client satisfaction – a premise that holds true more than 30 years later. The family owned and run business is headquartered in California’s serene mountains of Tuolumne County and remains heavily vested in its local, expanding community by participating in projects that drive sustainable growth for future generations. From its humble beginnings as a quality home builder in a rural area to today’s reputation as a seasoned contractor overseeing complex city and state jobs, Boyer Construction has continued to use a personalized approach to each individual project ensuring customer satisfaction time and time again. Our company is now proudly second generation, with the addition of Michael and Jesse Oliva as part-owners. 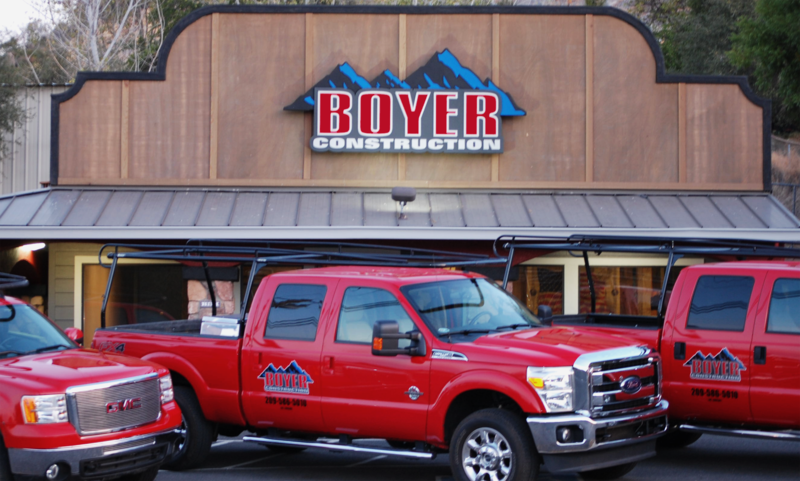 Boyer Construction is currently headed by owner, founder and President, Robert E. Boyer. Chief Financial Officer, Katherine Boyer, oversees day to day operations and budgets. Co-Vice Presidents Jesse Oliva and Michael Oliva manage operations in the field as project superintendents. We employ our own carpenters, and we have long-standing relationships with our employees – many have been with the company for 10 + years. We have been expanding our business to meet a greater diversity of projects and needs of our clients, but we retain our core philosophy that it starts with our relationships with our customers and the quality of our work. Our team is experienced in each facet of construction, and they have the knowledge and depth to handle large, complex projects. We pride ourselves on delivering projects on schedule, on budget, and with the highest quality – from every angle.